Contracts to the value of €468,000 in LEADER projects have been signed over the past few weeks in Cork County. 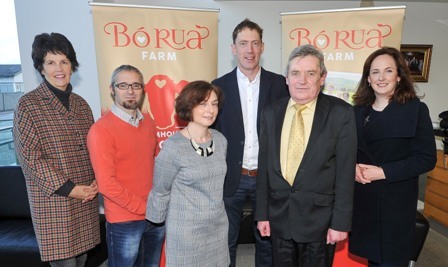 The first contract to be signed in the County was by Avondhu/Blackwater Development Partnership CLG for the construction of and commissioning of a specialised Cheese Dairy at Bo Rua Farm, Ballynoe which fell under the LEADER theme of Enterprise Development. This will enable them to scale up and commercialise their farmhouse cheese utilising the Dinneen family farm Montbeliarde cows whose milk is used in traditional French cheese production. Other projects include the development of playgrounds in Inniscarra Community Centre, Grenagh and Innishannon plus a project involving the erection of street name plates in Dunmanway. In addition to above, there are 24 projects to the value of approx. €1M approved by the Local Action Groups (LAGs) of North/South & West Cork which are going through the final steps prior to issuing of contracts. Decisions on LEADER funding are made at a local level by the three Local Action Groups (LAG) North, South & West Cork which are a sub group of the Local Community Development Committees (LCDCs). Cork County Council are the financial partners with the Department of Rural & Community Development for this programme. A Local Development Strategy forms the framework for decision making. The programme is implemented on the ground by six Implementing Partners, namely: Avondhu/Blackwater Partnership CLG, SECAD Partnership CLG, Comhar na nOileán CTR, IRD Duhallow CLG, Ballyhoura Development CLG and Údarás Na Gaeltachta.